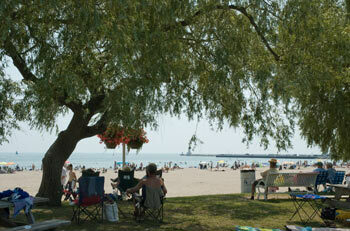 Cobourg BeachCobourg is known for its harbour and beach. The harbour was once used by large ships - at least by Lake Ontario standards and it was originally used as an industrial port but is now purely for leisure craft. Medium sized craft can visit or call us home since Cobourg now has its own dredger to keep the harbour deep enough. Cobourg's beach is known as the best from Toronto to about 2 hours East of Toronto and crowds on hot summer days attest to this.